From sunrise to sunset, the area around Lakeside, Ohio’s dock is where the action is. There’s never a rainy day at Lakeside, Ohio, making it the perfect summer vacation spot for all ages. Sure, it rains at Lakeside. It’s in Ohio after all and on the shallow, sometimes precarious south shore of Lake Erie. That doesn’t mean the weather puts a damper on vacationing visitors, some who come from California and other foreign countries. 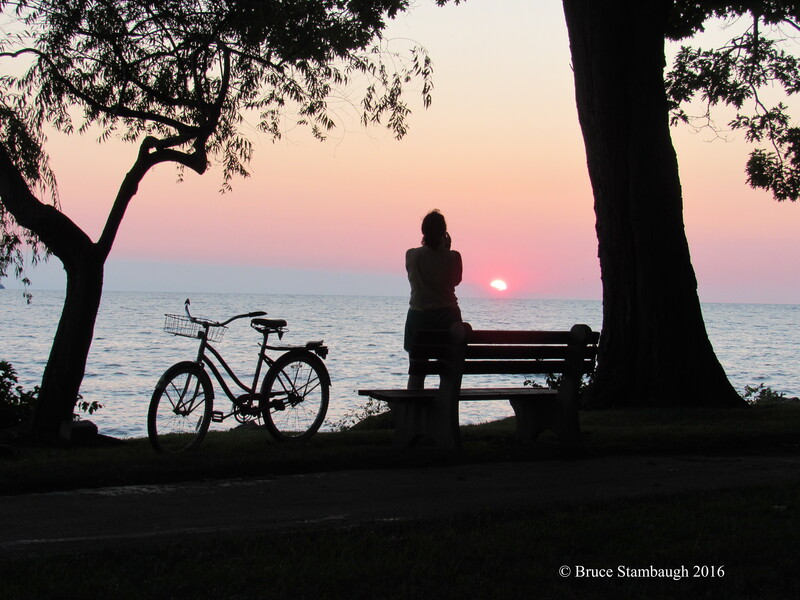 The weather, no matter how fierce, can’t quash Lakeside’s infectious community spirit. Sunshine or downpour, you can witness Lakesiders being Lakesiders wherever you go in the little resort town populated with quaint cottages and genial folks. If it does rain, which it did on more than one occasion during our latest week in the Chautauqua on Lake Erie, no one dismays. Plenty of great activities await, with gaggles of polite people to encounter. Steamboat style cottages dot the streets of Lakeside, Ohio. The new splash park is a cool hit with youngsters on a hot summer’s day. If the weather denies them that chance, you can likely find them sitting on one of the many inviting front porches that distinguish Lakeside cottages and homes. A wise, gray-haired grandma centers a wicker loveseat, arms embracing grandchildren. They read aloud, do word games, Sudoku, or tell family stories, true and otherwise. If three generations can’t enjoy a rousing round of miniature golf under the canopy of old-age hardwoods, the family won’t grow bored. They might turn to board games, Scrabble, chess, checkers, or Monopoly. 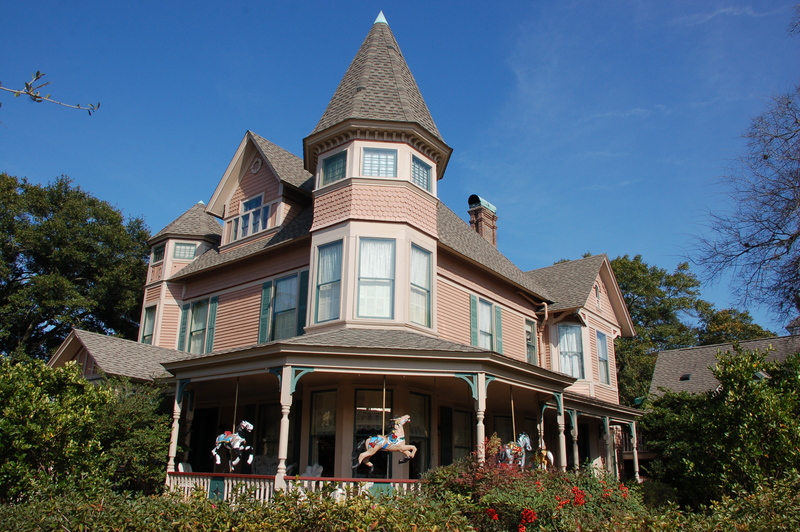 Thanks to its Chautauqua pillars of religion, education, arts and entertainment, and recreation, Lakeside is known for many engaging activities. 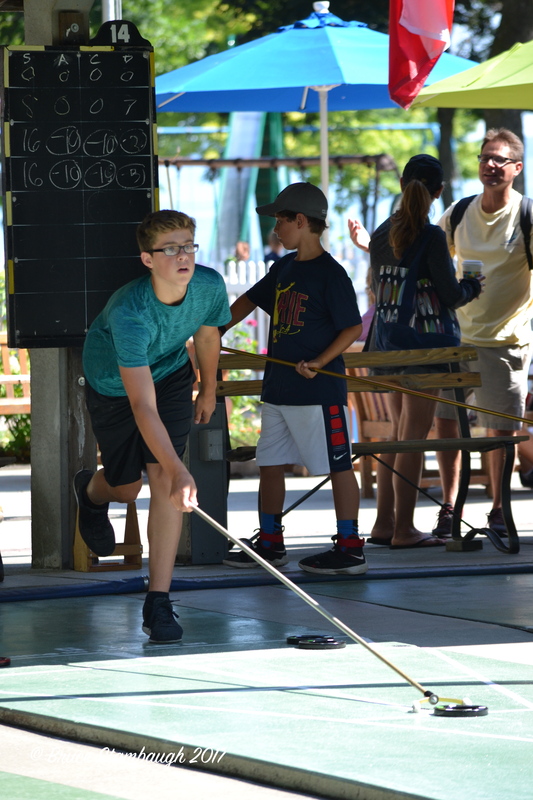 Since 1928, shuffleboard has topped the sporting list historically. Tennis, too, has its fair play at Lakeside. Families, couples, teams, and playing partners ply clay and paved courts for fun and competition. Should it storm, chairs soon form a tight ring around antique dining room tables, cards are shuffled, and the competitive spirits are expended differently. Instead of power drinks to keep them going, homemade sweet tea and lemonade hit the spot. 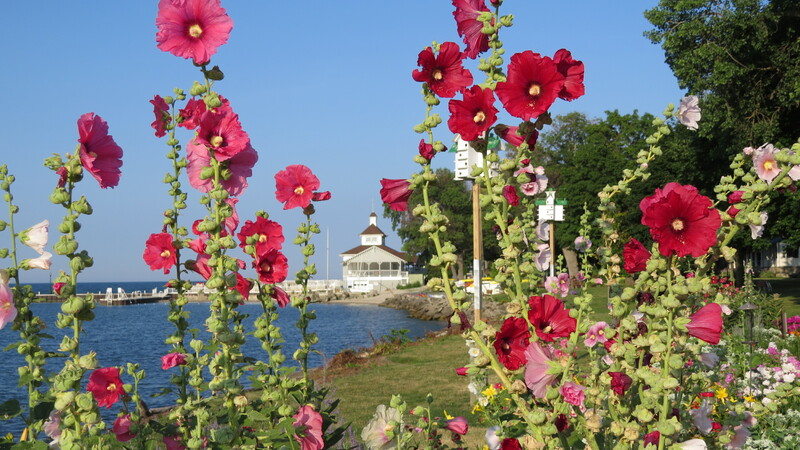 Colorful flowerbeds hug the shoreline at Lakeside. The Lakeside dock is the place to be. The Wooden Boat Show brought out both lots of boats and people. The Lakeside waterfront, centered by the pavilion, is where the daytime action is. The Plein Air Arts Festival drew many artists and admirers. A Farmers’ Market is held twice weekly at Lakeside. The view from Hotel Lakeside is lovely. Kids enjoyed the new Splash Park at Lakeside. Sunset swims are a good way to complete a day at Lakeside. Around the two-mile jogging trail that rings Lakeside’s boundary flows a steady stream of fitness. If the weather is too ugly to brave, brainpower replaces muscle power through summer reading or a spirited round of dominoes with family, friends and visitors. The Lakeside dock is the centerpiece of the summer sun worshippers. Young swimmers, sailors, fishing generations and sun soakers congregate to do their things. In the event that the dock is closed due to inclement weather or northerly gales that swamp the cement pier with crashing waves, alternative plans are made with few complaints. 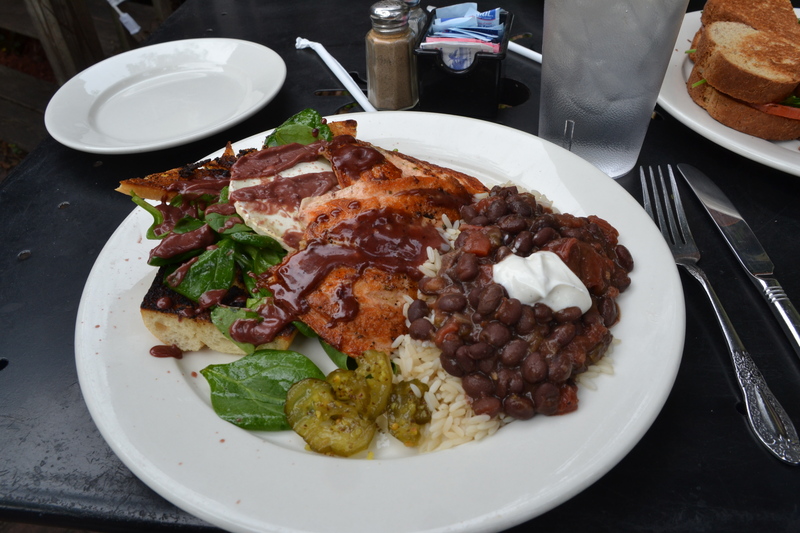 The handful of Lakeside’s eclectic restaurants and niche cafes, where scores of high school and college students earn a summer’s wage, offer plenty of fare and latitude to accommodate all. Patience whets the appetite for homemade donuts and refreshing ice cream. Even on the sunniest of days, hundreds of folks hungry for other kinds of food are filled to capacity by the rich stories offered by the weekly chaplains. It’s as cerebral as it is churchy. Weather-resistant, creatively designed indoor activities abound for children, while adults pick and choose between lectures, programs and displays. Nearly every week, some sort of special community function is offered. Evenings bring out a large portion of the town’s population for a medley of performances in historic Hoover Auditorium. Others linger dockside basking in the glow of another inspiring sunset, sometimes only minutes after the end of an all-day rain. Rain or shine, there really are no rainy days at Lakeside, Ohio. 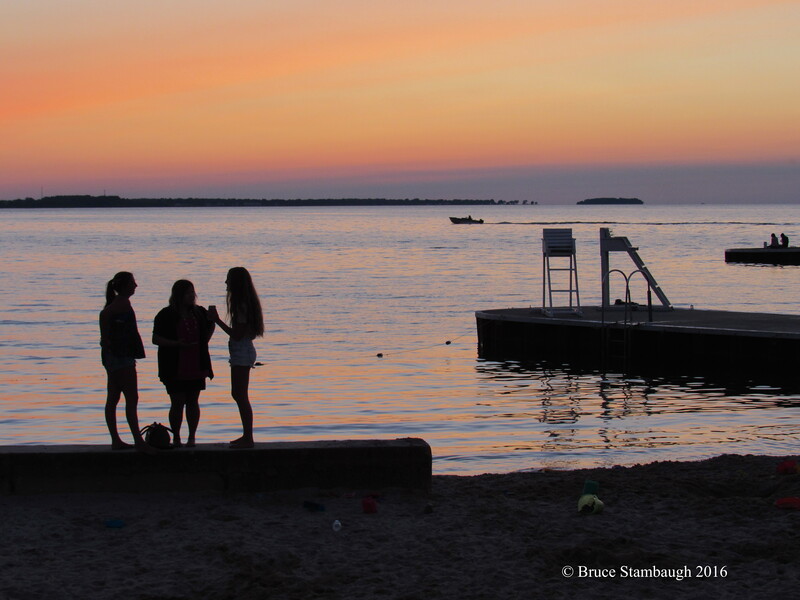 Watching the sunset from the dock is part of the Lakeside tradition. If I had to choose between vacationing in the mountains and spending a week on the beach, I would always head to the mountains. But you don’t always get your way in life, especially when consistently out-voted three to one in a democratic family. I thought about that recently while relaxing, you guessed it, on a beach. A towheaded little girl jumped in glee as the next lapping froth of a broken wave tickled her toes. The roar of the crashing surf drowned out her joyous squeals. 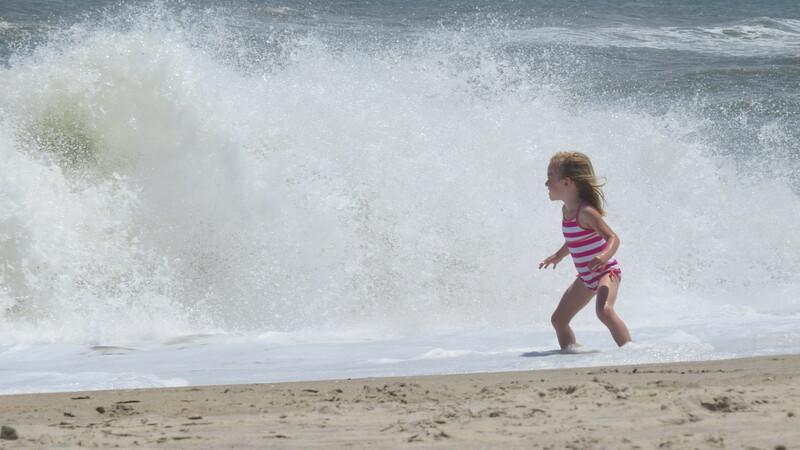 Our four-year-old granddaughter was fearless at the beach. Sandy-haired young boys, already tanned from summer baseball games, challenged the powerful surf head-on and lost. Deposited several feet down shore, the pair still celebrated in the foamy residue. The gamey boys shook their heads like wet dogs, and went back for more. The excited little girl and the rollicking boys were our grandchildren. Watching them soak up the benefits of a beach vacation scarcely differed from the memories of our own daughter and son savoring the seashore when they were young. The infectious laughter and shrieks of oceanic ecstasy displayed by the grandkids perfectly mimicked those of our son and daughter. Clearly, the family beach vacation tradition continues. The seashore in the summer is always mesmerizing. Senses are invigorated. The Cape Hatteras Lighthouse is an iconic symbol for vacationers on North Carolina’s Outer Banks. The sight of whitecaps frosting the rolling water, the sound of wave after wave pounding the beach, whiffs of salty sea air, the texture of gritty sand beneath your bare feet, incredible sunrises and awesome sunsets, animated shorebirds, and picturesque lighthouses soothe even the harshest of souls. Growing up, our children certainly had plenty of opportunities to catch ocean fever. Once the kids were old enough to enjoy extended trips, the beach seemed to be the destination of choice, no matter what dad suggested. We fitted in informative historical spots and intriguing geographical venues in route to the shore. The beach, however, was the main allure. Our family beach escapes could actually serve as a partial chronology of our life together. 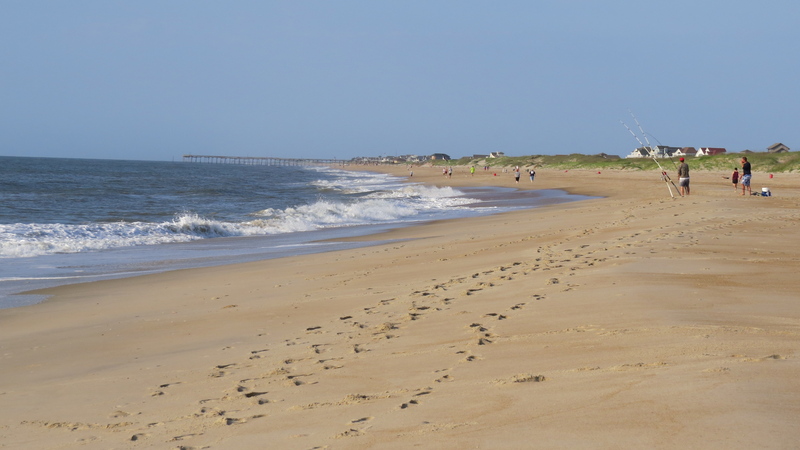 The first such jaunt was to Ocean City, New Jersey. The kids were hooked, on the beachy benefits, not the historic landmarks of Philadelphia, Pennsylvania that we visited on the way. Intriguingly, our son-in-law and his family had vacationed there, too. 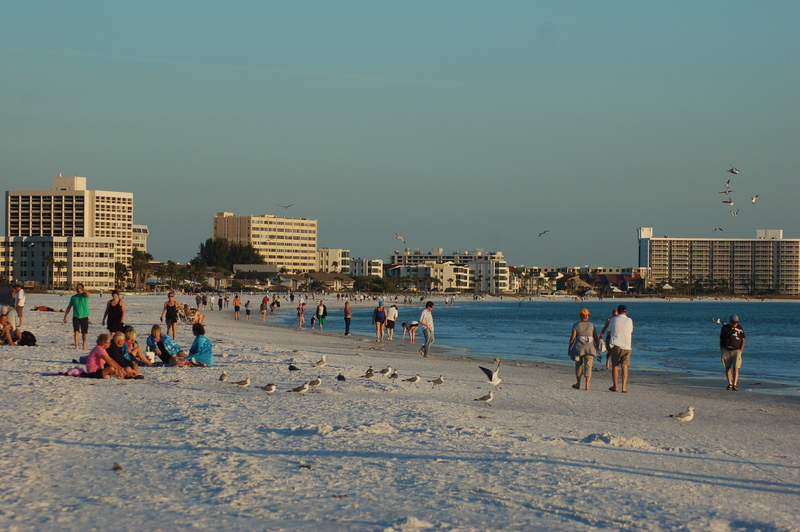 Sarasota, Florida’s Siesta Key Beach is rated one the world’s finest. After that we did Myrtle Beach, South Carolina, and Cocoa Beach and Siesta Key Beach in Florida. Each year the kids upped the ante in where they wanted to plop their beach blankets. Eventually, it was California here we come. I was all for visiting the left coast of the country. It truly would be a family vacation since both my wife and I had relatives and friends in the Golden State. Besides, this would provide an excellent opportunity to get the family into some real mountains, Yosemite National Park being the main destination. Though they wouldn’t admit it then, our son and daughter loved Yosemite as I had hoped they would. 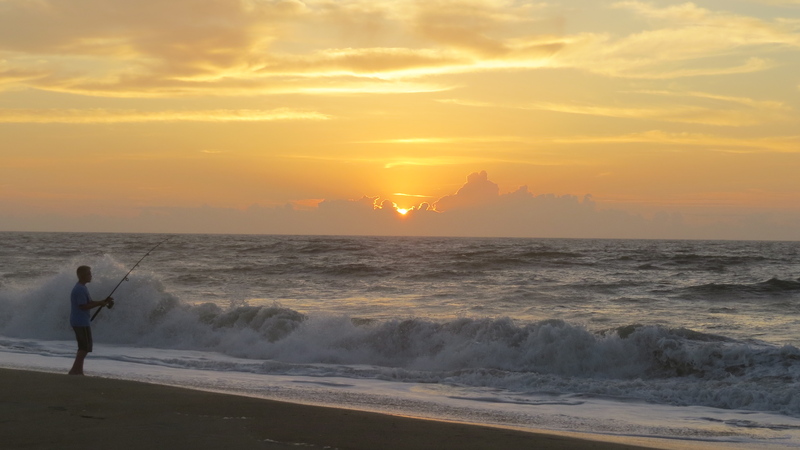 The Summer Solstice sunrise on the Outer Banks was a beauty. Still, it was being on the beach with their cousins that drew them. Our children were pleased until they hit the water at Huntington Beach. Even though we were in southern California, the ocean was a bit too chilly for swimming. Nevertheless, they soaked up the Orange County suntan time and the lively interacting with their kin. Another crashing breaker swamped the grandsons. 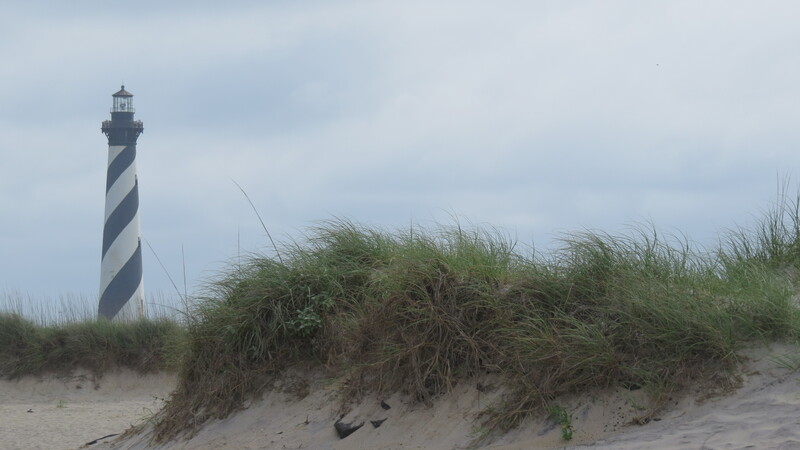 Their fair-haired sister kept building her Outer Banks sand castle. I continued to snap the camera’s shutter capturing the unfolding fun while I mentally recalled the many pleasant scenes on the beaches of our family life. 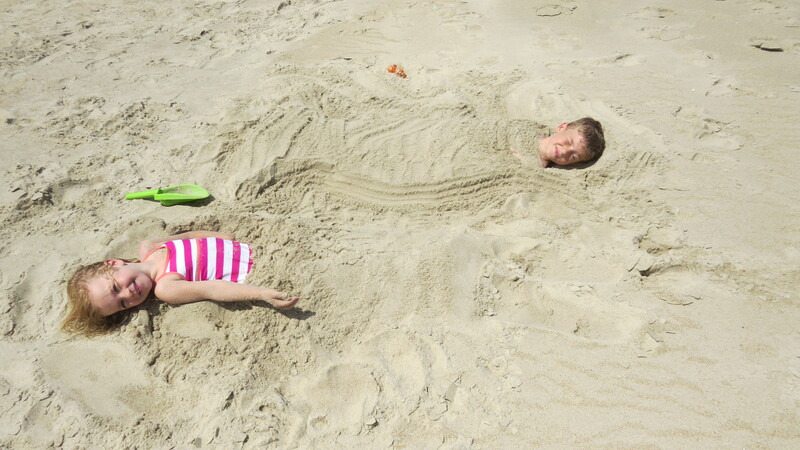 Being buried in the sand is a part of every beach vacation. 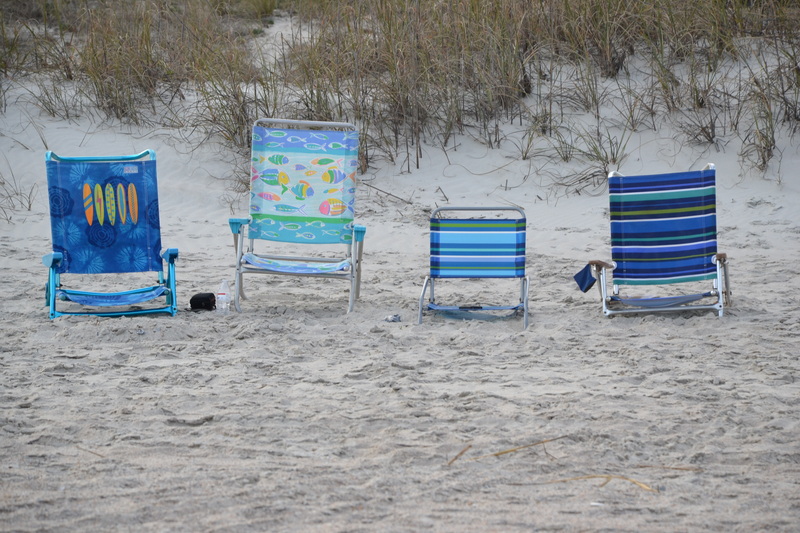 Finding just the right spot to relax on Main Beach, Amelia Island, Florida in January is not a problem. I used to question the wisdom and practicality of vacationing twice in the same location. Perhaps my personal wanderlust interfered with my empathy for the travel preferences of others. With so many places to visit locally, regionally, nationally and globally, I reasoned why would anyone want to return to the same place year after year? Surely the urge to explore and discover had to be greater than the certainty of returning to the same destination at about the same time each year. I’m rethinking that opinion. I am in a transitional period of my life, intentionally between full time employment and true retirement. I’m enjoying the freedom that comes with a flexible schedule. 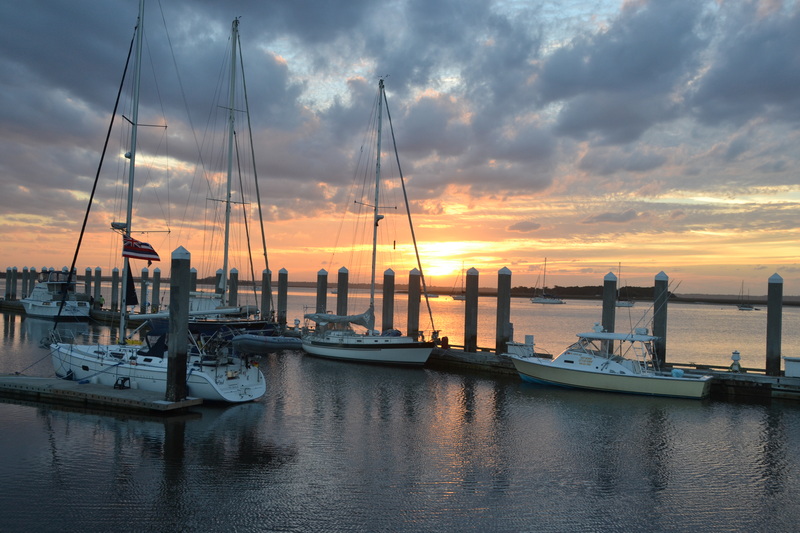 The harbor at Fernandina Beach, Florida offers many a scenic sunset. I still like visiting new locales, seeing new topography, meeting new folks. I am also beginning to more fully appreciate the contentment of familiarity. 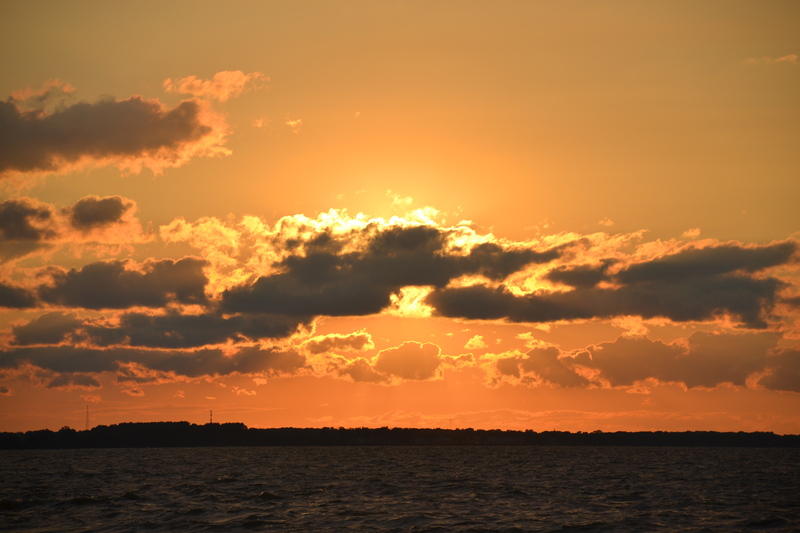 I realized that fact recently while my wife and I bathed in the glow of another incredible sunset over the harbor at Fernandina Beach, Florida. For someone who practically calls Lakeside, Ohio his summer home, it should have been obvious to me. I guess I considered our Lakeside stints more tradition than vacation. Silly me. We had found Amelia Island almost by accident last year. It was an overnight stop on the way to our true vacation destination, Sarasota, Florida. We liked the island so well we spent two more days there on the way home. We were hooked. 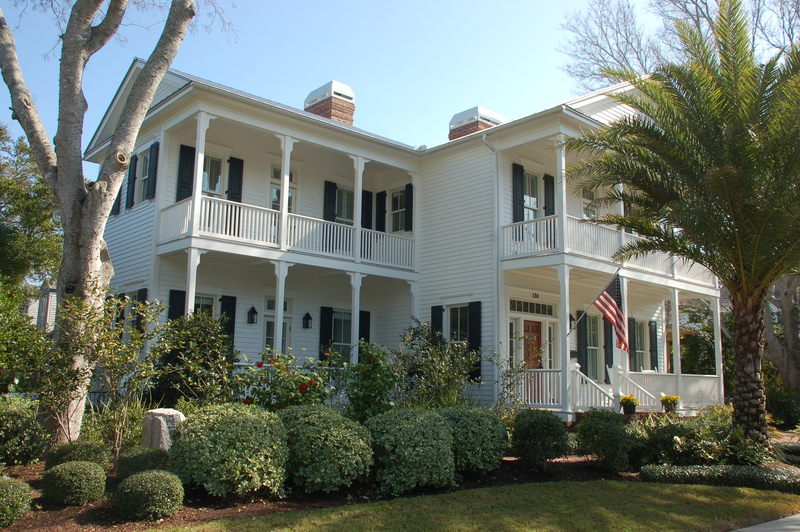 Charming homes line the streets of Fernandina Beach, Florida. 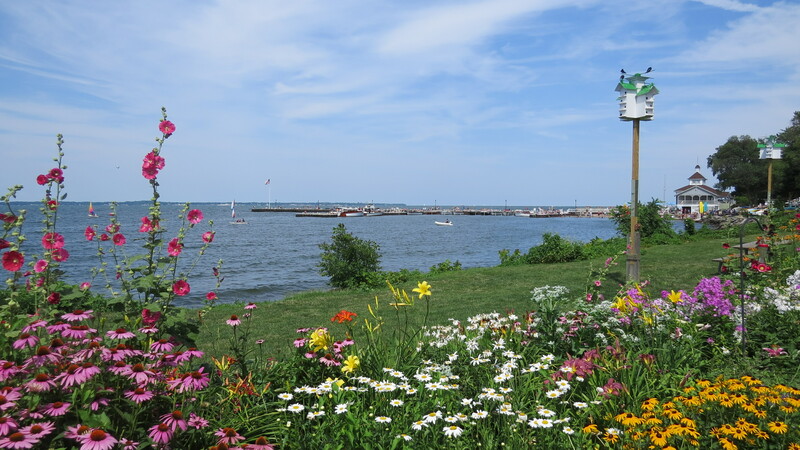 We loved the island’s charm, its beautiful beaches, its commitment to wildlife habitat preservation, its rich history, and the diversity of activities it offered. We had only skimmed the surface last year. We needed to return to further explore this intriguing community. Last year the weather, like most places in the country, was exceptionally warm for northern Florida in January. We walked the nearly vacant beaches in t-shirts and shorts. I birded the island’s preserve. We dined on locally caught seafood. We were in paradise instead of Ohio in January. It felt marvelous. This year we returned to this magical destination for two weeks in order to dig deeper into the island’s many treasures. The weather couldn’t match that of 2012, but we had fun nevertheless. Cooler mornings warmed into pleasant days. Shorts and sandals were only appropriate a couple of days this time around. 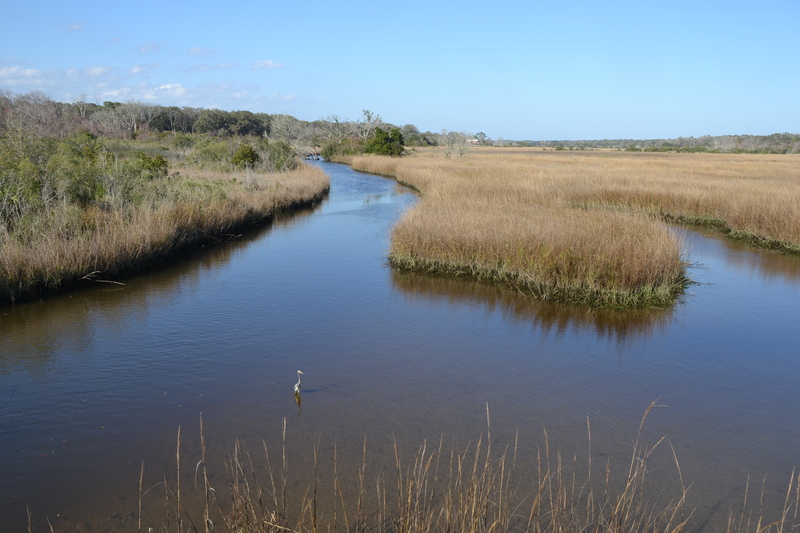 Egans Creek Greenway offers biking, hiking, fishing and birding on the north end of Amelia Island. We toured the local history museum, lunched outside at most restaurants, and collected perfect seashells of all sizes and colors. 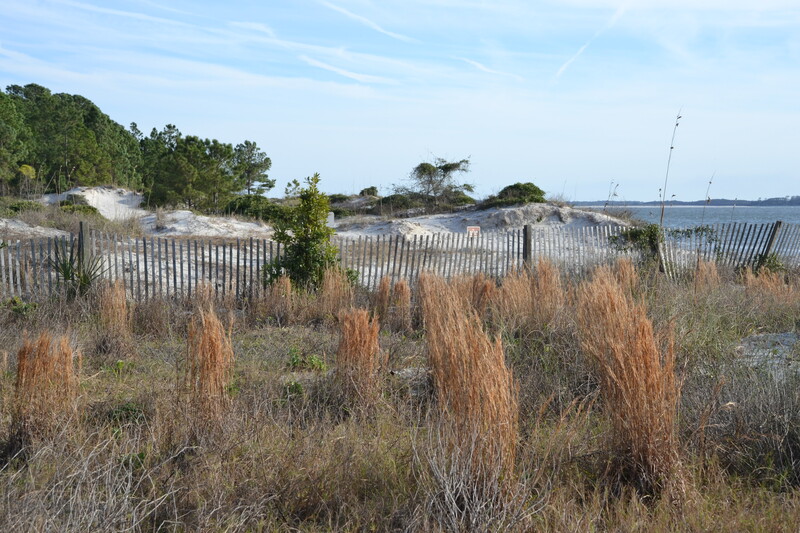 I hiked the paths through Fort Clinch State Park and Egans Creek Greenway enjoying the flora, fauna and breath-taking vistas and spring’s emerging pastels. My epiphany came while I hustled around the boardwalks at Fernandina Beach’s harbor photographing yet another sunset. A patron sitting at a table of a dockside restaurant hailed me, wanting to know if this was my first time on the island. 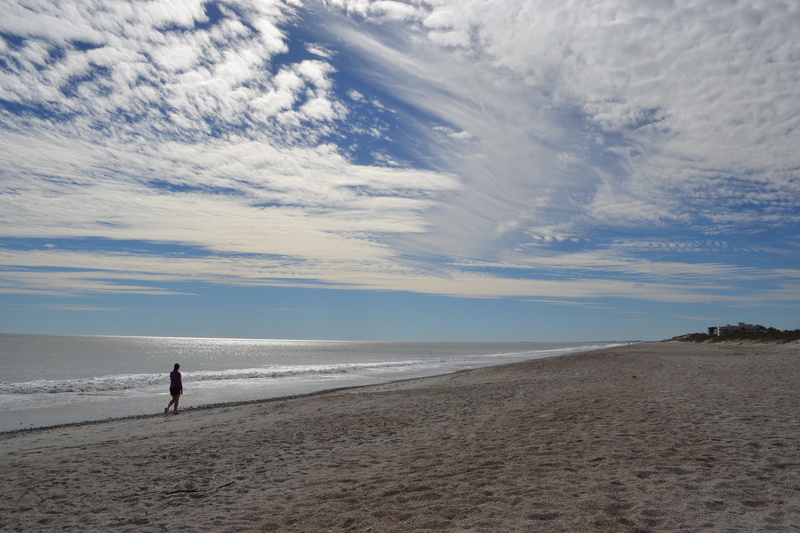 Amelia Island State Park, at the southern tip of the island, is a great place to relax, walk or fish. When I innocently replied that it was not and then read the man’s surprised facial expression, it hit me. To him I must have looked like a child on Christmas morning as I dashed around trying to get different angles of the ever-changing colorful sky. I had taken many, many sunset shots last year. Yet here I was plying for more. Lightning struck. I recognized why people did repeat vacations. I was relaxed, happy, appreciative, satisfied, if not downright blissful. Amelia Island, Florida in January 2014? Why not? It could become our traditional winter vacation. 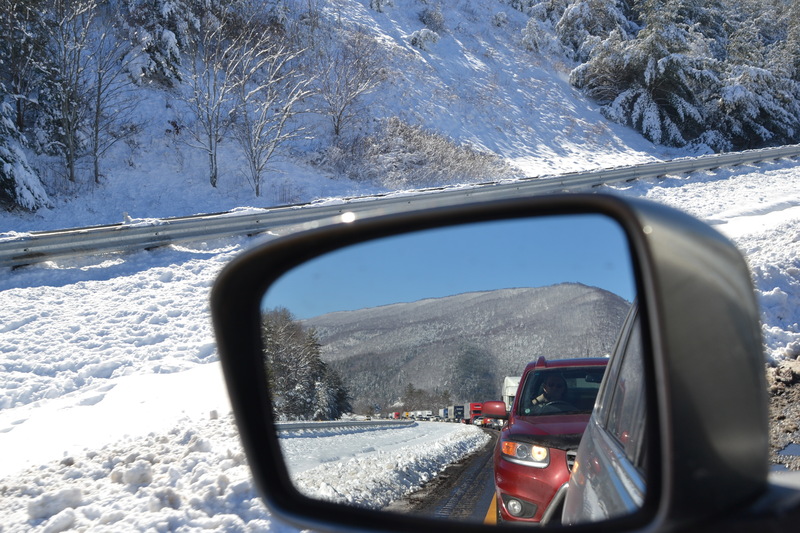 A Manhattan-like traffic jam occurred in the snow-covered mountains of Virginia on our way to Florida. My wife and I love to travel. It’s a common interest that we’ve had since we met nearly 43 years ago. We feel fortunate to be at the station in life that allows us to travel when the opportunities arise. Of course we enjoy the various places we visit. We also like the people we meet along the way. We encountered a cast of characters on our latest trip to Florida. 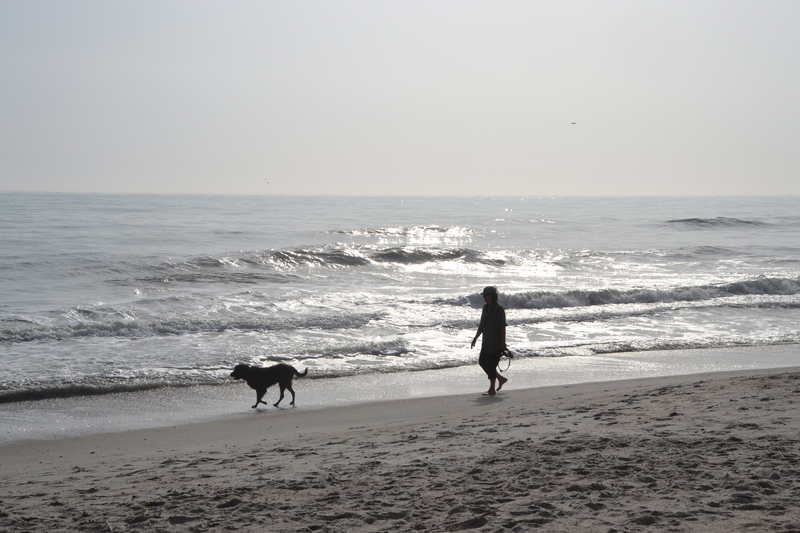 Walking the dog along Main Beach is a common sight on Amelia Island, Fla.
We have learned that a tank of gasoline will take us to Wytheville, Va., where the gas conveniently happens to be cheaper than most locations. We make it a regular pit stop if you get my drift. This go-round there was only one problem. The previous day’s heavy snow had brought down rural power lines. With no electricity, the pumps weren’t working. I asked the kind clerks behind the counter where the closest station was with power. They said we had passed it seven miles back. I asked about further south, the direction we were going. They said they knew that Hillsville had power, and indeed that’s where we refueled. We learned from a brief visit last winter that our destination, Amelia Island, Fla., had equally friendly and helpful people. It didn’t take us long to prove that correct again this trip. The food was delicious and the staff very helpful at Kelley’s Courtyard Cafe in Fernandina Beach, Fla.
After settling into our rental lodging, we went to the Happy Tomato Café in Fernandina Beach, Fla. for a late lunch only to discover that the eatery had closed for the day. Not to fear. A staff member came out and steered us to a competitor just down the street. We weren’t disappointed. The waiter at this café was kind enough to direct us to the local grocery store. His directions were perfect. On my first long walk on Main Beach on the Atlantic coast, I was photographing a flock of wintering gulls and skimmers. A middle-aged couple and their teenage son apologized to me for disturbing the birds and making them fly. I told them they actually had helped create the picture I had wanted, some birds on the wing, others on the sand. In further conversation, the couple and their son revealed that they were lettuce farmers near Jacksonville, and rattled off local restaurants that purchased their produce from the local farmers’ market. I indicated that we had sampled the fare of several of them. 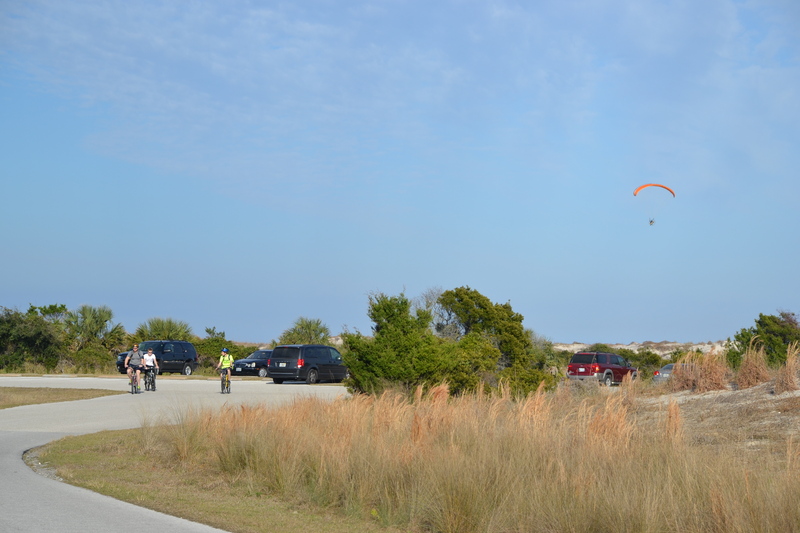 Bike riding and para-sailing are just two of the many outdoor recreational activities on Amelia Island, Fla.
Later an elderly man walking his dog on the beach struck up a conversation with me about surfers and para-surfers he had seen. In our protracted discussion, I learned much about the man’s long, productive life as a government contractor. At the Amelia Island History Museum, it was volunteer guide Paula’s turn. A retired social studies teacher, she was ideal for the job. She rattled off more information than my brain could absorb. I’m glad she didn’t give us a pop quiz at the end of her lecture. At the Maritime Museum on the waterfront, Don was equally congenial, though more laid back. Retired Navy officers are like that. We spoke as if we were long lost friends. Now we’re just new ones. In Savannah, Ga., Nate made roses from reeds. 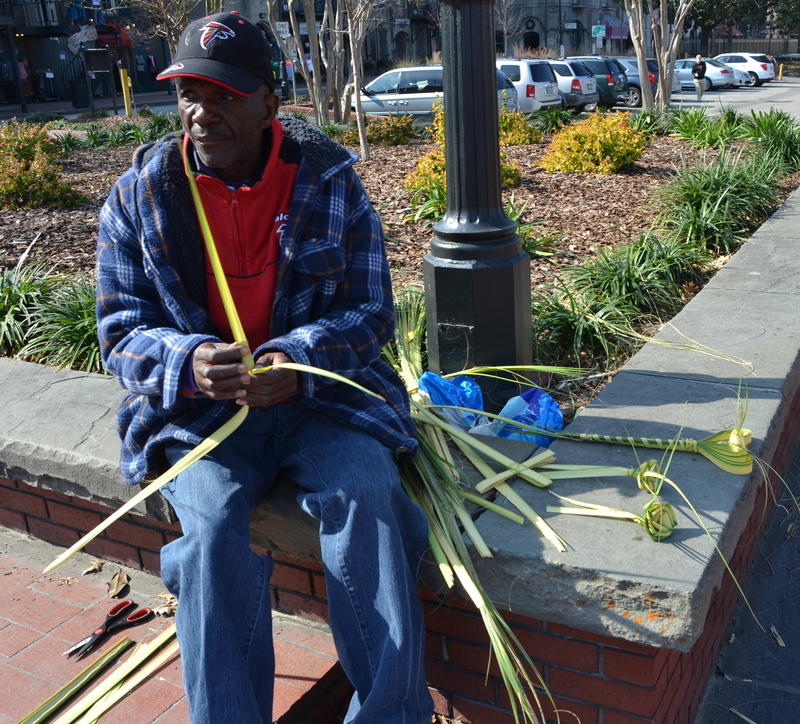 On a day trip to Savannah, Ga., we met Nate, who made roses out of reeds for his living, which was modest by any standard. “Just call me Peanut,” Nate said. And so I did. My wife and I savor our travels together. We enjoy the outgoing people we meet even more. 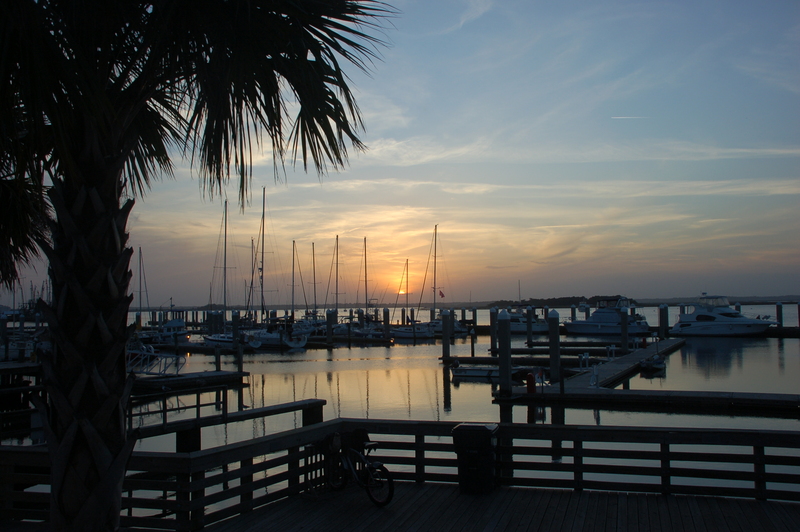 Sunsets are spectacular over the harbor at Fernandina Beach, Fla.
Sunset at the harbor, Fernandina Beach, FL. It seems no matter how much planning my wife and I do for each trip we take, we find at least one unexpected gem along the way. 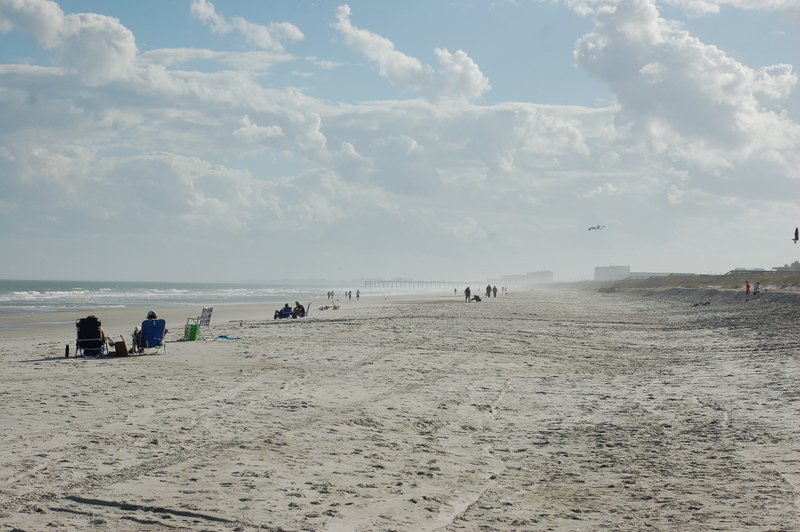 Amelia Island, Florida was just such a place on a recent trip to the Sunshine state. The unpretentious island initially was to be no more than a one-night layover to our final destination, Sarasota. It didn’t take long to realize what a diamond in the rough we had found. The island’s natural amenities alone deserved a closer look. 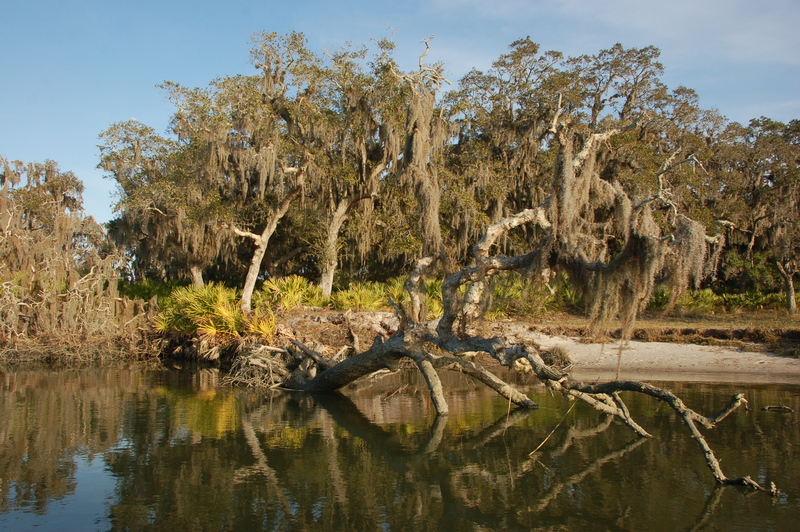 A typical scene of live oaks and palmetto palms along the Amelia River. 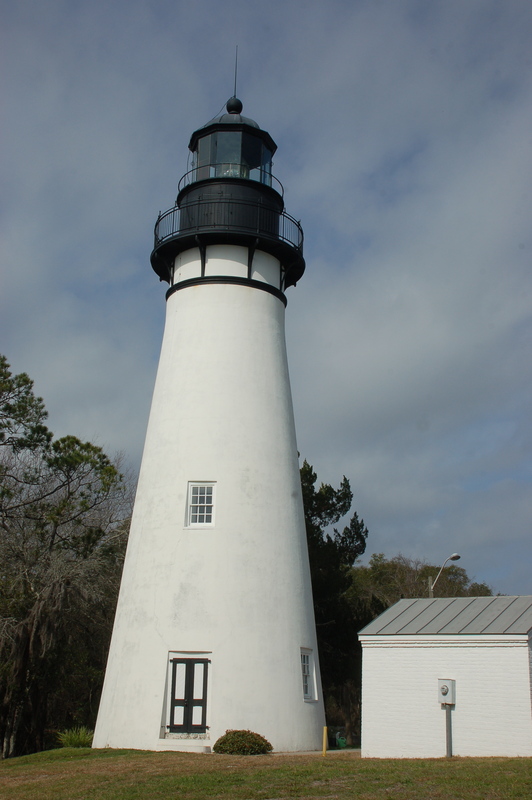 On the way home, we stopped at Amelia Island for a two-day self-guided tour. Once we started to uncover the island’s riches, we could have spent two weeks there. 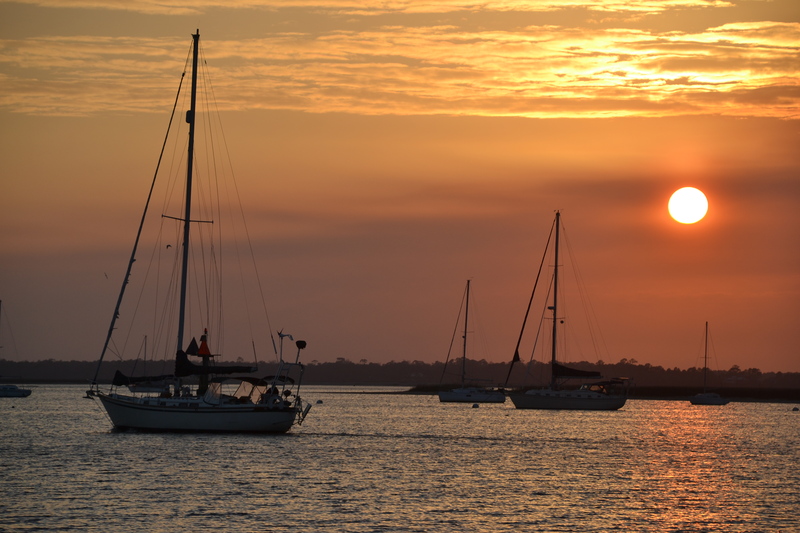 Steeped in history and oozing with natural beauty, Amelia Island’s chief charm seemed to be its modesty. Just inside the Florida line from Georgia, I sensed the island and its people knew what they had, but just didn’t want to flaunt it. Main Beach on the Atlantic Ocean, Amelia Island, FL. On the Atlantic Ocean side, Main Beach runs the entire length of the 13.5 mile long island. In the off-season, resident and migrating birds far outnumbered the exploring humans combing the beach or local teens windsurfing. The Pippi Longstocking House, Old Towne, Fernandina Beach, FL. 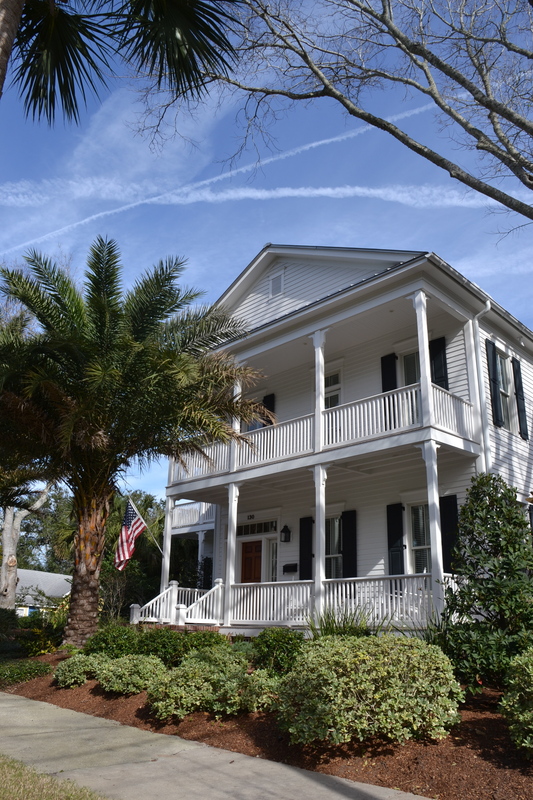 On the inland side, historic Fernandina Beach graces the island’s picturesque waterfront. Here’s where the island’s modesty reigned. The beautiful little town was actually settled three years before St. Augustine, which bills itself as the oldest in the country. Fernandina Beach lost its historic distinction when the Spanish conquistadores massacred the French settlers and all the island’s indigenous people, too. An open grassy square in the old town section still marks the spot. Ironically, one of the many distinctive houses in the town stands adjacent to the infamous slaughter. The old place was used as the setting for the 1988 Pippi Longstocking movie. Back in town, the oldest bar in Florida was temporarily converted into an ice cream parlor for a scene in the movie. The island’s elementary children were recruited for an ice cream fight until the reality of the hot Florida weather melted the main prop. Colored mashed potatoes were instant replacements to complete the filming. Well-preserved historic buildings make up the impressive downtown. Locally owned restaurants serve locally caught seafood, while upscale boutiques attract shoppers from near and far. 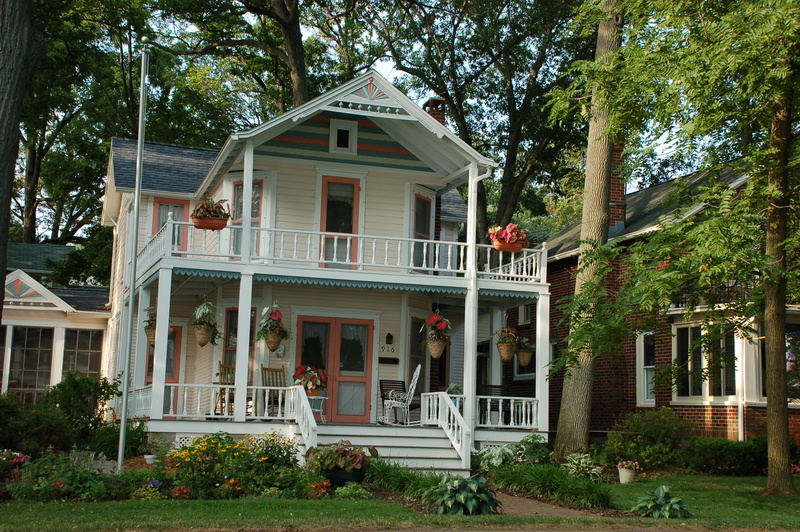 Stately, well-maintained homes from bygone years line the north-south streets off of the main drag. 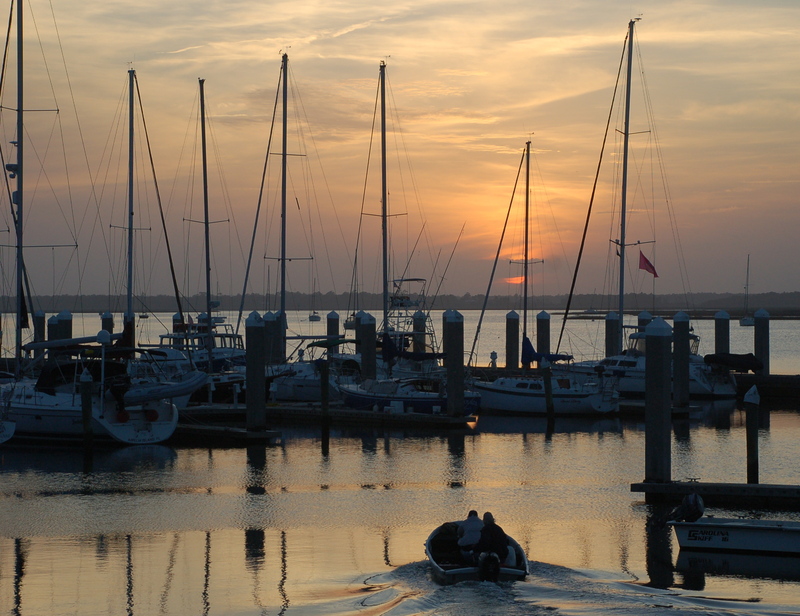 To say Amelia Island’s attitude is small town would be an understatement. A fender bender outside our hotel brought four cruisers. 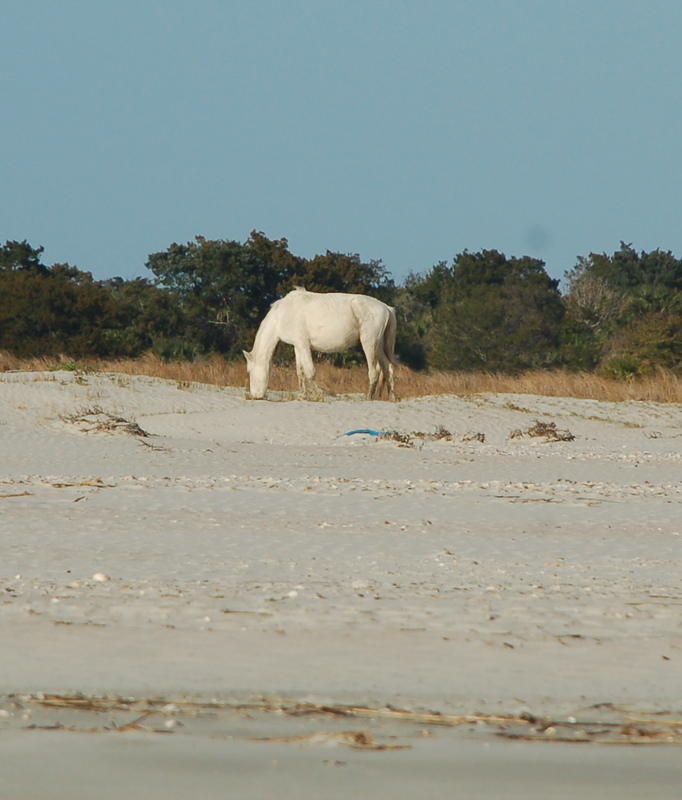 Wild Spanish stallions still graze on the many isolated islands near Amelia Island. The desire to keep things as they are reaches far beyond the town itself. An outstanding state park features a Civil War fort. Egan Creek Greenway runs down the middle of the island for birders, joggers and bikers to enjoy. A charming lighthouse, still in operation, keeps watch over it all. Take a boat cruise and you discover even more gems about this unheralded island. Rare birds, bottle nosed porpoises, wild Spanish stallions, and salt truncated live oaks are all part of the treasure chest of Amelia Island. 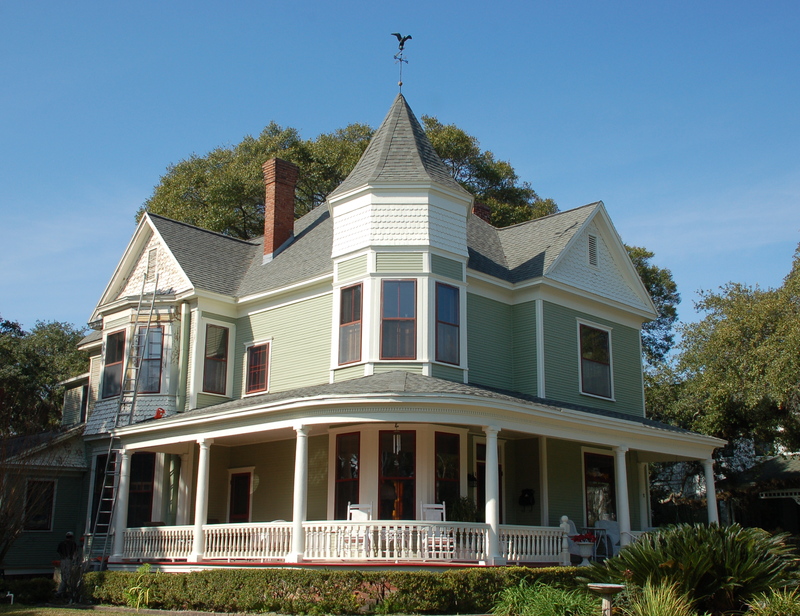 The Bailey House, one of many well-maintained historic homes in Fernandina Beach, FL. Even in the two additional days of exploration, we couldn’t uncover all of the island’s hidden nuggets. That will make our next visit all the more exciting. 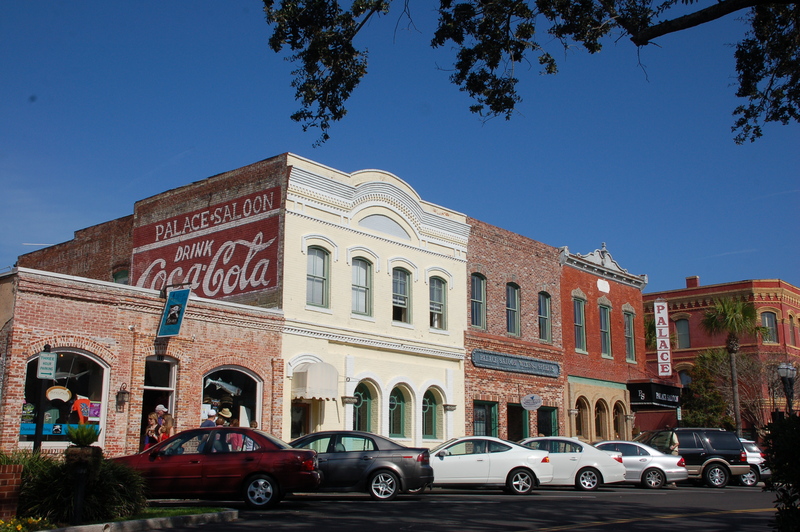 Just some of the old buildings is historic downtown Fernandina Beach, FL. 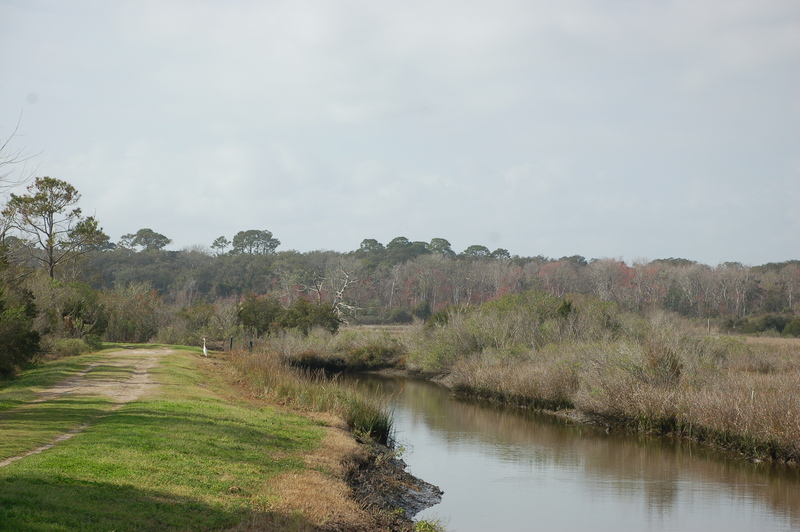 The Egan Creek Greenway in the center of Amelia Island provides opportunities for birding, biking, jogging and walking. Humphreys House, getting a new coat of paint. 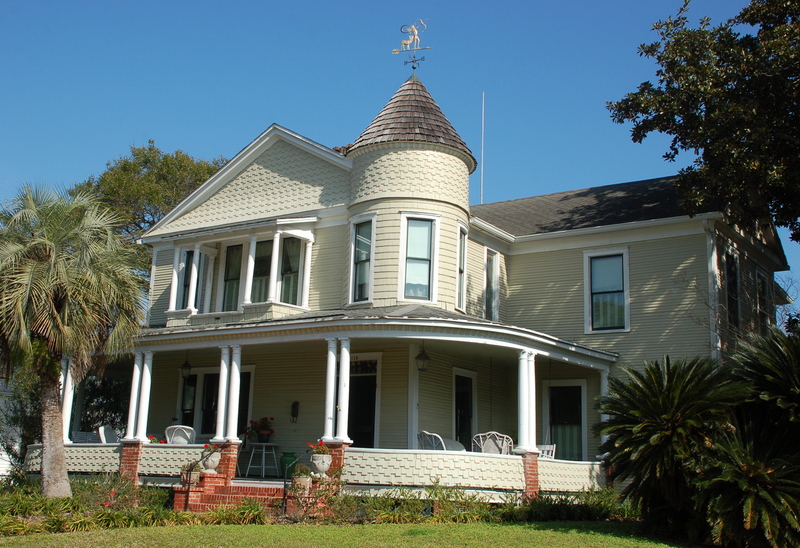 Baker House, Fernandina Beach, FL. 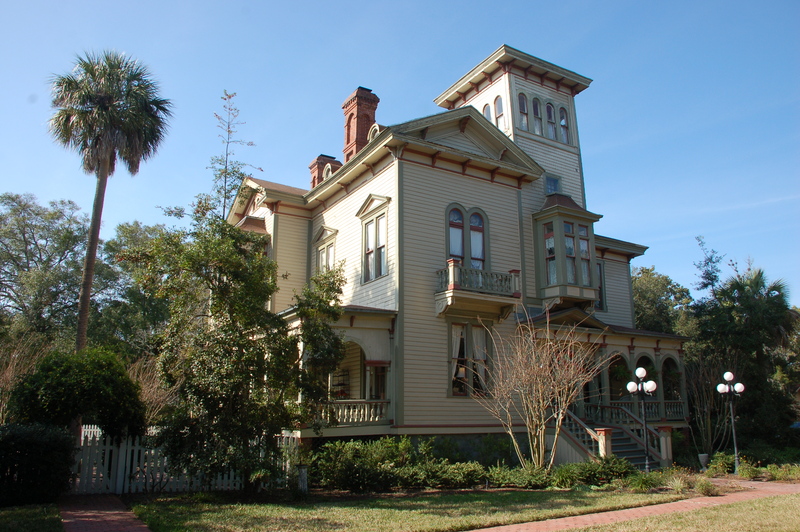 Prescott House, Fernandina Beach, FL. 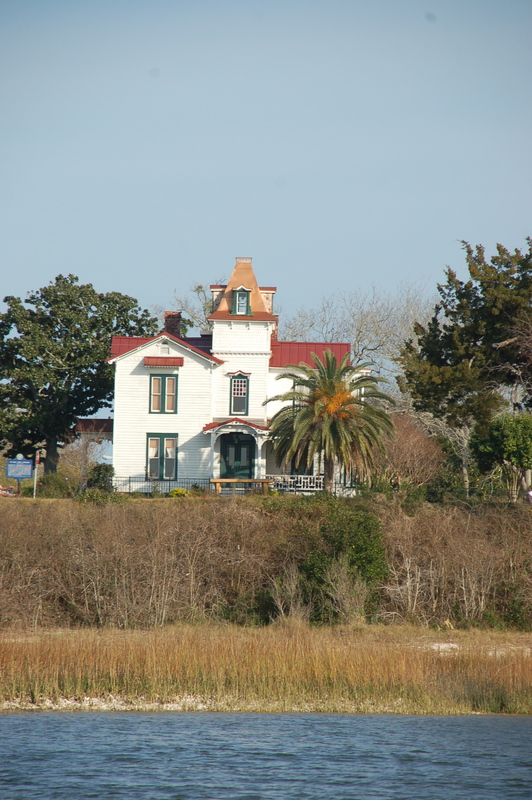 Meddaugh House, Fernandina Beach, FL. 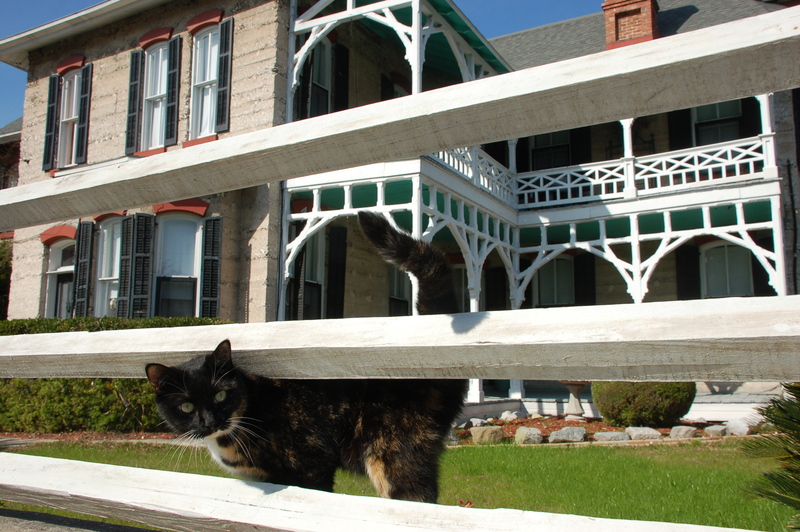 The Tabby House is appropriately named. 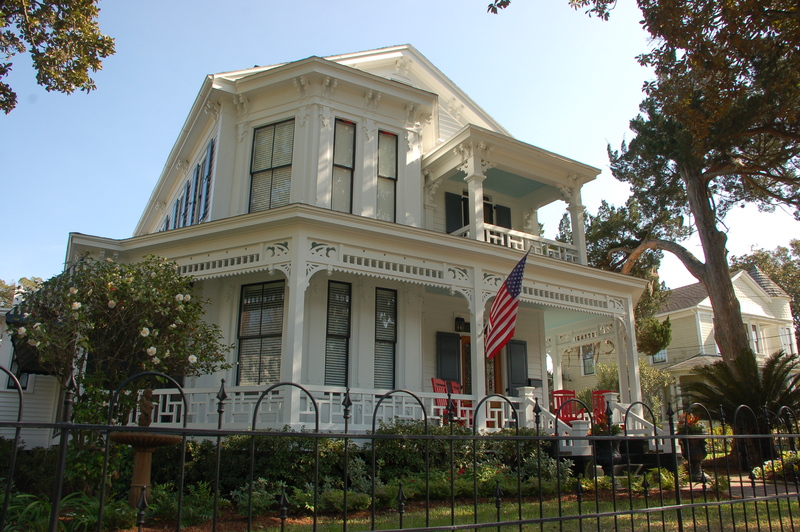 Fairbanks House, Fernandina Beach, FL. 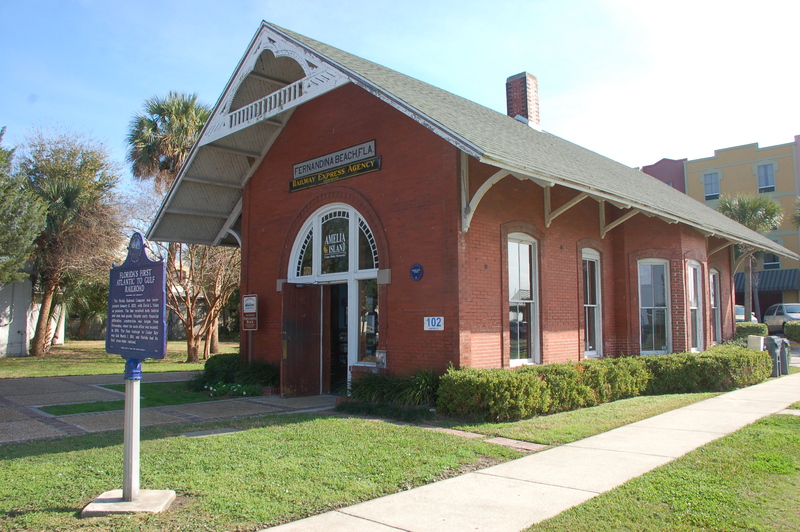 The old railroad depot now serves as a welcome center near the waterfront in Fernandina Beach, FL. Fishermen leave the harbor at Fernandina Beach, FL. Vacation is one of my favorite words. Perhaps it’s because it’s one of those duplicitous words in the English language that can be used as either a noun or a verb. I love to go on vacation. We will vacation at the beach. Either way, the end result is still the same. Vacation is vacation. My wife and I are fortunate to be at a point in our lives where we can get away, if only for a few days, without much hassle. When friends invited us to share a house with them in sunny Florida for a week, we cleared our schedules and confirmed our reservations. When you live in northern Ohio and it’s wintertime, there’s only one direction to go on vacation, and that is south. Clearly, I’m not a snow skier. At my age, I prefer the warmth to cold, and so do my old bones. 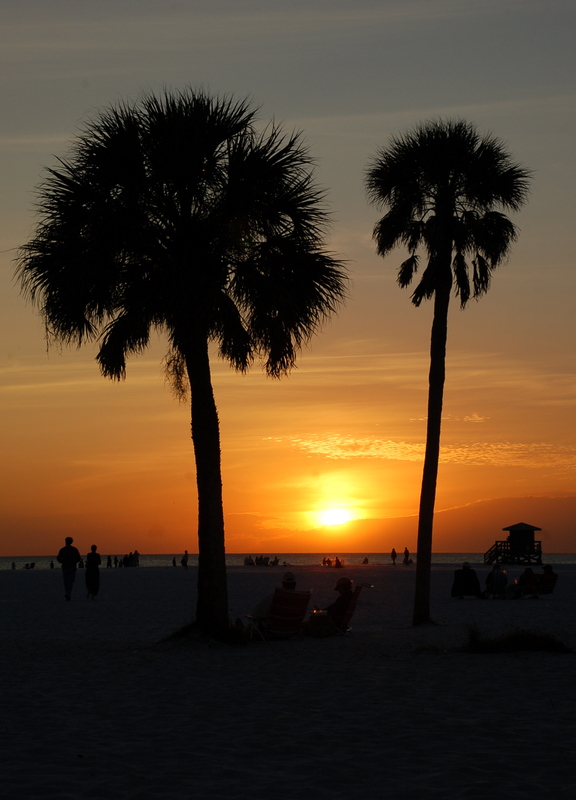 Sunset at Siesta Key Beach, Sarasota, FL. It’s more than climate that draws us away from our familiar digs, Holmes Co., Ohio, where up to four million visit annually. Most visitors to our area, however, choose spring, summer and especially fall to roam the bucolic Holmes County hills. Our curiosity and desire for adventure draw us away from our own congenial vistas as much as anything. We love to explore new places as well as revisit familiar ones. Our gracious Florida hosts planned plenty of interesting activities for us during our weeklong stay. Fortunately, we enjoy many similar activities as our friends. Like us, they prefer to pace themselves. It was vacation after all. No reason to rush. I could bore you with a verbal slideshow of our trip. I’ll just say we had a great time, whether we were on the most beautiful beach in the country, which we were, or enjoying an enlightening and informative historical tour, which we did. 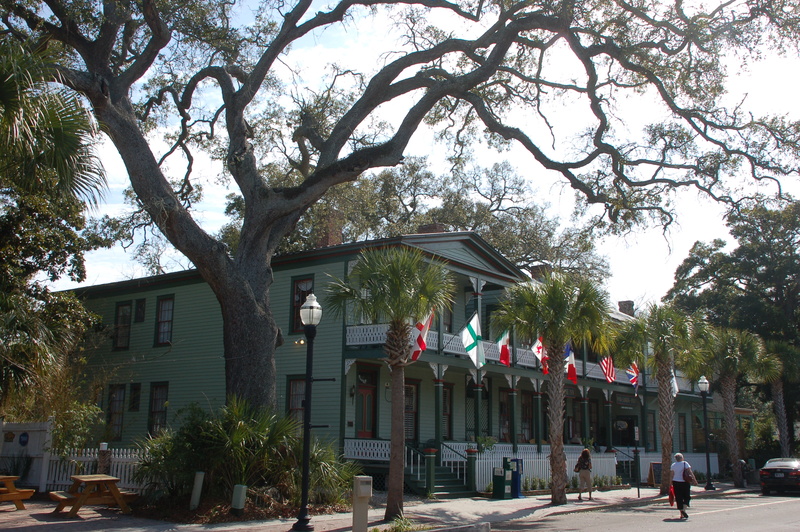 The Florida House, Fernandina Beach, FL, is the oldest operating hotel in Florida. Instead, I want to tell you about some of the people we encountered along the way. It happens wherever we go. I am fascinated and appreciate the kindness of pure strangers we encounter on our travels. Meeting new people is one of the vacation perks. Sure, there are a few goofballs almost everywhere. But for the most part, we have found people to be absolutely engaging, matching the gorgeous scenery that surrounds them. It is hard to single out any one person in Mt. Airy, North Carolina. Everyone we met seemed like a familiar character from Mayberry. 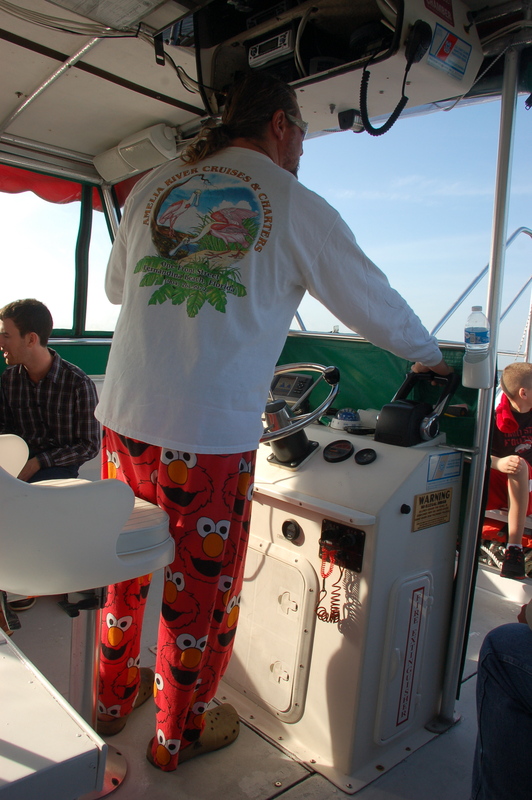 Captain Pajama Dave piloted our Beach Creek tour at Fernandina Beach, FL. The young and enthusiastic park ranger near Mt. Mitchell on the Blue Ridge Parkway was most helpful. He directed us to Asheville when we found the road unexpectedly closed. The kind lady at the Venice Rookery who encouraged us to return at dusk to watch the hundreds of nesting egrets, herons and ibises settle in for the night was a pure gem. Even a non-birder would marvel at that experience. Another amazing individual was our tour boat captain at Fernandina Beach, Florida. Captain Dave was as cordial and passionate about his lovely habitat as the history of the area was interesting. His trademark bright red Elmo pajama pants fit his personality and his passion for nature’s handiwork that he so eloquently pointed out. 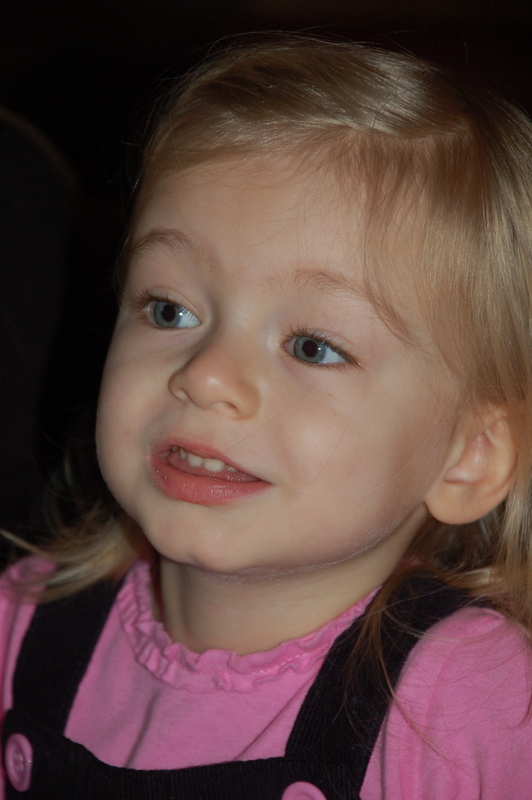 Finally, there was 2-year-old Juniper, the petite and perky daughter of some friends in Charlotte. We had never met her. Yet by evening’s end, she wanted “Pruce” to read her one more book. To paraphrase Dr. Seuss, Oh the places we’ve been and the people we’ve met. Together they make vacation a charmed word in our household.